The ComponentOne Studio FlexChart's addition of Funnel chart—an excellent tool for summarizing data—enables your users to quickly visualize stages in a linear process. Most often it's used to show sales processes to pinpoint potential problem areas, but we'll see in this blog that the uses can be extended far beyond sales. Any funnel consists of the higher part called head (or base), and the lower part is referred to as the neck. The values displayed are in progressively decreasing proportion and amount to 100% in total. 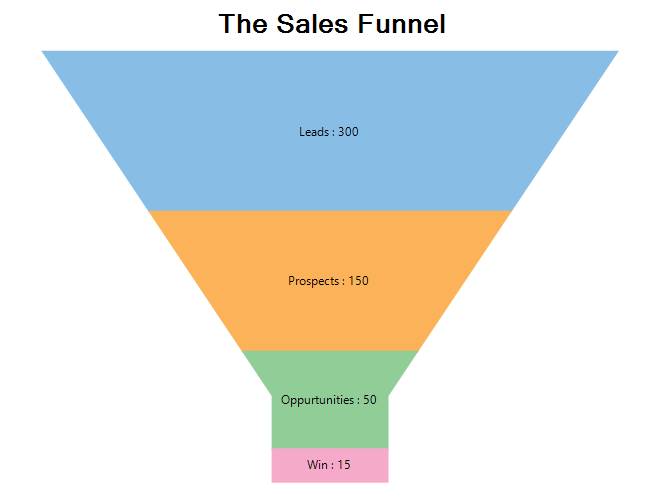 Basic sales funnel In general, Funnel chart is similar to a stacked percent bar chart or pie chart. They're often criticized for the analogy drawn with a kitchen funnel, but like that humble kitchen tool, they're very good at the one task for which they're designed. These charts can determine the health of a process or collect actionable insights. The name solely describes the shape of the chart, which shows narrowing of data as it passes through the various stages. The process aspect make the chart especially useful to managers and supervisors: people who need a good overview on what's happening. In case of sales, it’s a good visualization tool for sales managers, and less valuable for sales people. In other fields, it shows the flow and the final "win" number, which matters. 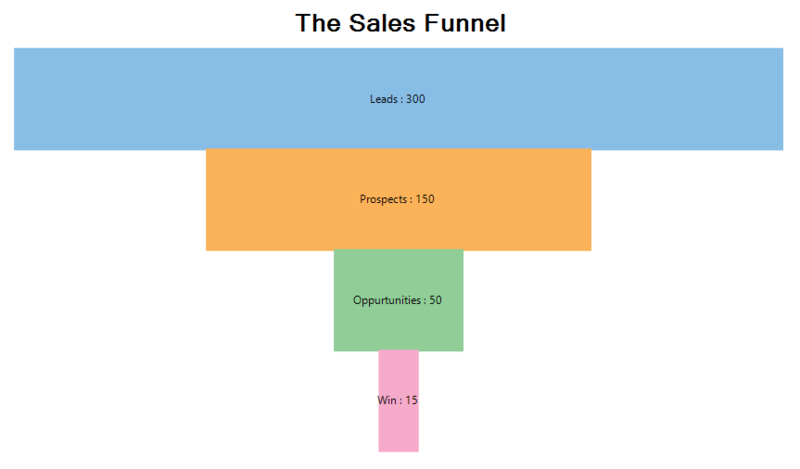 A funnel chart typically has two presentation forms: the trapezoidal look, as shown in the sales funnel chart above, or a stacked bar look in the chart below. Stacked sales funnel Before we dive in to the benefits of Funnel charts, let’s look at how the values are plotted in both these representations. Trapezoidal form: In this form, the area of each funnel segment represents its value: the larger the area, the greater the value of the segment. Segments having the same value occupy the same area and have different heights. This is because the segment closest to the Funnel head will have more width at its disposal when compared to the segment placed anywhere below it. Stacked Bar form: In this form, the width of the bars represents the value of the segments: the wider the bar, the greater the value. The segment with the greatest value is taken as a reference point, and all other segments are presented proportionally to it. For example, if the largest and second largest segments have a value of 1000 and 500 respectively, then the width of the latter will be exactly half the width of the former. 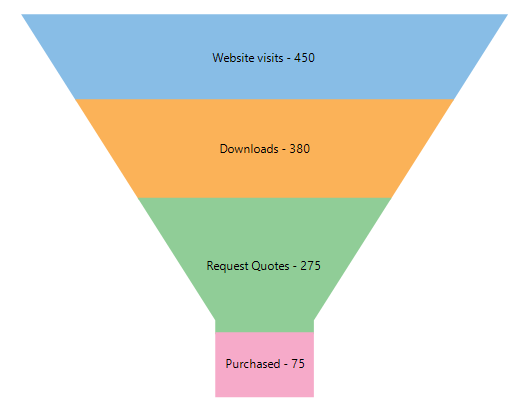 When should you use Funnel charts? Summarize Data: Funnel charts are an ideal tool for summarizing data. Not all charts are meant to display the complete details of your data, Funnel chart is one of them. They are best suited to be displayed in dashboards that are tailored to display metrics targeted for a single point of view, usually sought by the decision-making executives in an organization. Identify Bottlenecks: In order to constantly improve a process, it's important to evaluate performance at each stage. One needs to know when and where things went wrong, the points of concern in a process. Funnel charts are a great tool to serve this purpose. Analyze Conversion rates: Conversion rate is one of the most important metrics for decision-making in a sales or marketing process. It identifies the percentage of users who reach the last stage of the process, and that's best depicted by a Funnel chart. For example, the conversion rate for the website visits in the chart depicted above is 16.67%, which is good as the average conversion rate for ecommerce websites is around 4%. Higher conversion rate denotes better health of the current process.When associated with a process that focuses on elimination, the conversion rate can also be called as "survival" rate, or the percentage of users that survived till the end. 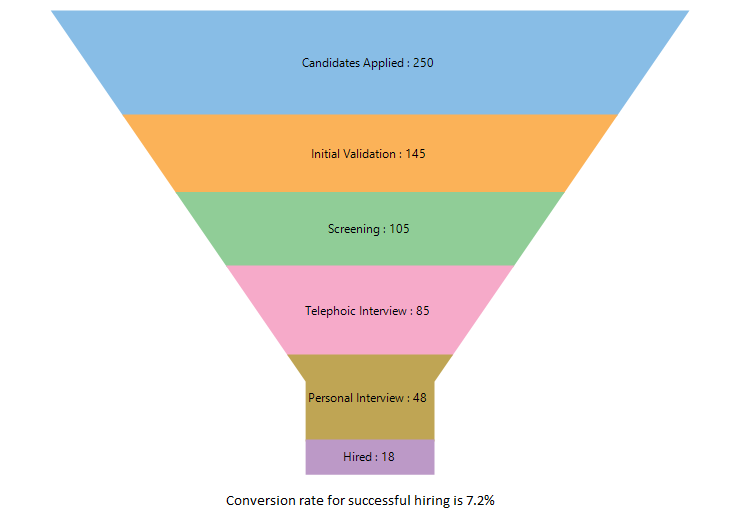 For example, in the chart below, the survival rate of the candidates in the depicted recruitment process can be analyzed to be 7.2%.